3-11 - A Rate, Not a Date - Epoch Investment Partners, Inc.
Three eleven is not a date; it is a percentage, 3.11%. It was June 13th of 2003 when the yield on 10-year U.S. Treasury bonds touched 3.11%, its lowest in decades. That date signaled the end of an era and the arrival of a new epoch: one of rising rates, at an undefined pace for an unknown period of time. Nothing is more threatening to financial asset values than rising interest rates. For historical perspective, the last time interest rates bottomed was 1946, the year that Congress enacted the Full Employment Act of 1946. That Act required the government and the Federal Reserve to pursue three objectives—full employment, stable prices, and maximum growth consistent with a full-employment economy. Two out of three objectives were realized. However, the goal of stable prices fell by the wayside as the specter of the 1930s loomed large over the shoulders of those executing economic policy, who allowed the relative importance of growth and employment to supersede price stability. 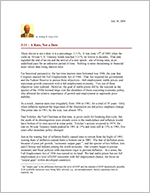 As a result, interest rates rose irregularly from 1946 to 1981, for a total of 35 years. Only when inflation replaced the bogeyman of the Depression era did policy emphasis change. The prime rate in 1981, by the way, was almost 19%. Paul Volcker, the Fed Chairman at that time, is given credit for breaking that cycle, but the seeds of its disintegration were already sown in the marketplace and inflation would have broken of its own accord at some point. Volcker’s actions occurred in 1979; the rate on 30-year Treasury bonds peaked in 1981 at 15% and were still at 13% in 1984, five years after monetary policy changed. Just as the waning fear of inflation finally caused rates to retreat from the highs of 1981, waning fears of deflation caused them to bottom out in 2003. The fear of deflation arose because of poor job growth, “economic output gaps”1, and the specter of two billion, low-paid Chinese and Indians joining the world economy. Our country began to pursue monetary and fiscal policies with maximum vigor to prevent deflation. In a sense, the Full Employment Act of 1946 was turned on its head. We had stable prices but not full employment or a level of GNP consistent with full employment (hence, the focus on “output gaps” within developed countries). The effects of these expansionary policies are very visible in today’s U.S. economy. Mortgage debt today is $7 trillion, twice the level of 1997, only seven years ago. Consumer debt (largely credit card and auto debt) exceeds $2 trillion, over twice that of ten years ago. Virtually all of this increase occurred when interest rates were declining. Floating rate mortgage debt, increasingly popular, has risen significantly as a proportion of total mortgage debt. For example, over one-third of mortgage applications filed in May 2004 were for adjustable rate mortgages. When one adds trade and fiscal deficits of almost 10% of GNP, a war whose costs seem limitless, and oil prices at multi-year highs to these consumer balance sheet issues, the resultant scenario is hardly conducive to low inflation and interest rates. Only one conclusion can be drawn from this state of affairs. Interest rates, after falling for over a generation, are going up. This will affect the financial landscape profoundly. Here are our thoughts. Being long pure interest rate risk is financial suicide. In other words, long-dated U.S. Treasury bonds should be avoided (with the possible exception of TIPs (Treasury Inflation Protected Securities)). Owning a long-dated bond in a period of rising interest rates is a little bit like lead poisoning. At first you take no note, but ultimately it kills you. For example, in the bear bond market of 1946 to 1981, holders of 2 ½% 30-year U.S. Government bonds lost 83% of their principal, measured by purchasing power. Globalization is a good thing in our view and we have written often on this subject. On a world scale, globalization will lead to increased earnings and productivity. Globalization plays—including agricultural companies, energy firms, infrastructure entities and many others—will be the winners of the next decade. As an example, twenty years ago, according to one source, there were 60 private passenger vehicles in China3. China now manufactures that many each minute. It is estimated that when, not if, Chinese living in that country’s coastal regions (a population of about 160 million people) own automobiles at the same rate as South Koreans, the world will need two new Saudi Arabias just to satisfy their gasoline demand! Energy will be a play for a decade, as will be certain farm commodities such soybeans. Equipment and service providers to these industries should thrive as well. Of the positive events happening in today’s world, most are centered in the Far East. These Asian countries have low labor costs, a highly productive workforce, strong currency fundamentals (unlike ours) and, in the case of Japan and large parts of China, a well-established industrial infrastructure. Asian plays, whether local or not, offer extraordinary return opportunities. With respect to the economic relationship between the U.S. and China, there likely will be an uncoupling of the symbiotic relationship between trade and Asian bank purchases of U.S. Treasury securities that has existed in recent years. As the Far East’s middle class grows and its banking system matures, this linkage should weaken. Increasingly, the region’s growth rates will become internally generated, and its economies will no longer be perceived primarily as feeders or mercantile economies to the more developed countries of the world. Investing opportunities will emerge within these economies as the middle class grows. A consequence of rising interest rates is falling P/E ratios, other things being equal. The remaining drivers of total return for equities will be dividends and earnings. As long as there is a 15% tax rate on dividends, management of many companies will be incentivized to reconsider dividend policy. Microsoft is one recent example; others surely will follow. Dividends matter; companies that offer reasonable yields plus the likelihood of increased earnings can be expected to outperform those companies lacking those attributes. Free cash flow will replace earnings as the leading analytical metric. We have written on the subject before and will do so again. Free cash flow is, quite simply, a less subjective measure of corporate performance than other benchmarks. Suffice it to say that once free cash flow level is defined, there are only five potential uses—dividends, stock re-purchases, debt pay down, acquisitions and internal capital projects. Which one or combinations will most benefit shareholders? We seek to identify those companies that possess a good business with strong cash flow generation and whose management thinks as a shareholder would. In summary, an epochal event occurred on June 13, 2003, when the ten-year Treasury bond rate touched 3.11%. That day portended the end of a long era of declining interest rates. The resulting sea change in the economic world will affect asset allocations within both the fixed income and equity segments of investment portfolios. On average, P/E ratios likely will decline with dividends and free cash flow replacing P/E ratios as the most important sources of investment returns. (Expanding P/E ratios explained nearly half of the returns on equity securities from 1980 through 2000.) The changed interest rate climate will eventually impact today’s symbiotic relationship between Asia and the U.S. whereby we buy their goods and they buy our paper to finance our deficits so we can buy more of their goods. That relationship will become less stable. The freight train of globalization cannot be stopped. It is creating significant opportunities to profit, but one must, in many cases, seek them beyond our borders. A one-dimensional regional perspective will no longer suffice for successful investing. Finance is now borderless and it requires a borderless perspective. 1An “output gap” is the difference between the level of GNP and the amount of GNP theoretically possible if all available resources were being fully utilized; e.g., no unemployment, factory operating rates at capacity, etc. 3We assume that this excludes government-issued vehicles.